Santa at the Montclaire Shopping Center! Beautiful outdoor courtyard and fountain at Old Orchard. Their current (Westfield-owned) website is right here. Well, at least the name fits, for the trees make it look a little like an orchard. I never could understand why you'd put an outdoor mall in IL. You sure don't see 'em like this anymore. It's actually a very high-end mall. It's quite beautiful. That being said, it's pretty much useless in the winter. They have the trees to put the little italian lights on in the winter silly. I used to live by the Oakbrook mall in Illinois and man due they have a crew that goes out during the night and gets every bit of snow out of there. it amazed me even during a blizzard that palce was being worked. after all the mall must go on tee hee. My aunt and uncle lived right down the road from Old Orchard, and I remember them talking about it when it was built. My uncle was thrilled, and said he could "stick his head out the window and see it." She still lives in that house, we love to visit and go shopping. Today Old Orchard is totally different, more upscale, but not quite at the Northbrook Court level. Cold in the winter. Been there in winter and there are still plenty of people hanging around. Even went shopping there while it snowed once. This shot looks like it's right outside from the Nordstrom. I remember standing by that fountain as a little boy, when it was brand new . 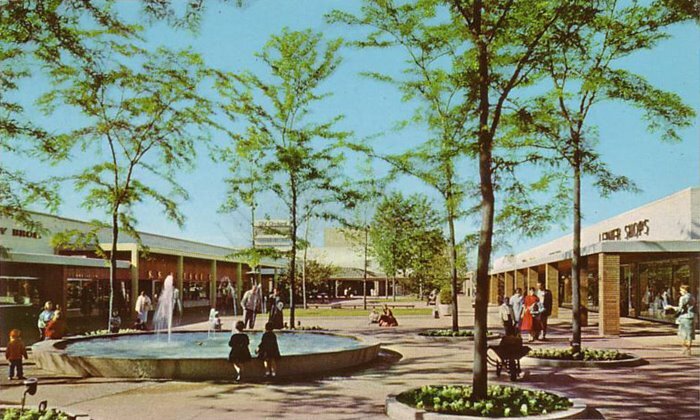 I live quite near Old Orchard and it is my favorite mall *because* it's an outdoor mall. Even in winter, it's nice to step outside the stuffy, dry, overheated stores for a breath of air. Also, it makes you feel more real, not so sterile. Once the weather gets cold, they turn off the fountains and put evergreen boughs in them--very pretty for Christmas. In response to Didi's comment that it looks like it's right outside of Nordstrom's - Nordstrom's was not there, not even the building it's in, when this photo was taken. The fountain in the picture was right outside the north entrance of Marshall Fields. The camera is looking north towards the tall Old Orchard office building. Does anyone remember what year the remodeling took place? They added theatres that year. The modernist look of the original has been submerged beneath a rather twee bunch of details. I lived near this mall for about 18 years, and still shop there when I return to Chicago, but it lacks a lot of the old charm. And Marshall Field's is of course now a humdrum old Macy's. "I never could understand why you'd put an outdoor mall in IL." That is because Illinois is in the Midwest, not the Arctic. There are four distinct seasons in the Chicago area and it is a pleasure to shop or sit outdoors in good weather. Look at the trend toward "lifestyle" shopping centers and the "de-malling" of older center. Many of these places have outdoor spaces and are highly successful. With that said, Old Orchard is a very nice place to shop because I do have a bias toward outdoor malls and I like seeing open sky when going from one store to another. I do, however, miss the center's old look. The renovation totally disrespects the original design, which in my opinion was very classy and of high quality. Northpark Mall in Dallas was built during the same time period and has recently doubled its size. It retained the white brick facades of the earlier 60's design, updated the infrastructure within the older part of the mall, and it remains "the place to shop" in Dallas (a town with many other malls that give Northpark very strong competition). It does not look dated. I wish Old Orchard had taken that course in its redesign. The Chicago area had three major outdoor malls at one time-Old Orchard, Oakbrook, and River Oaks. River Oaks (IMHO) has been enclosed and has lost something in the process. The enclosed space makes no sense to me. Old Orchard and Oakbrook are open to the sky and have a less claustrophobic feel to me. Snow and ice are dealt with in typical Chicago fashion-it's part of life, move it out of the way quickly and life goes on. It does not keep the crowds from enjoying their shopping nor does it keep high-end merchants from locating their stores in these centers. "You sure don't see 'em like this anymore." A little late, but I think Old Orchard was renovated in the early '90s- maybe '91, '92, or '93. I was 6-7 at the time and lived in Chicago, so my memory is a little hazy, but I remember visiting the old mall as shown in the picture. I really liked the old mall a lot more. The old design was pretty classic and if they had kept it that way another 15 years, people would be going back just for the nostalgia.